The Geospatial Web will have a profound impact on managing knowledge, structuring workflows within and across organizations, and communicating with like-minded individuals in virtual communities. The enabling technologies for the Geospatial Web are geobrowsers such as NASA World Wind, Google Earth and Microsoft Live Local 3D. These three-dimensional platforms revolutionize the production and consumption of media products. They not only reveal the geographic distribution of Web resources and services, but also bring together people of similar interests, browsing behavior, or geographic location. 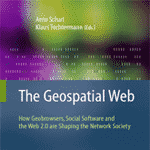 This book summarizes the latest research on the Geospatial Web’s technical foundations, describes information services and collaborative tools built on top of geobrowsers, and investigates the environmental, social and economic impacts of geospatial applications. The role of contextual knowledge in shaping the emerging network society deserves particular attention. By integrating geospatial and semantic technology, such contextual knowledge can be extracted automatically – for example, when processing Web documents to identify relevant content for customized news services. Presenting 25 chapters from renowned international experts, this edited volume will be invaluable to scientists, students, practitioners, and all those interested in the emerging field of geospatial Web technology.